We may not be seeing a lot of sun but let's be happy it stopped raining. We are ready whenever you are. 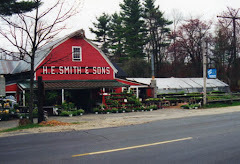 FYI: the plants you buy from us are the same ones we grow in our fields to supply our farm stand. They are selected for quality, flavor and our NE climate. I will be by soon to buy vegetables for my garden. Since it has been a cold spring when do you think it would be ok to put veggies in the ground?